I first came to know the work of Conor Walton through his portraits. Portraiture is an interesting art, and an essential one too, in that, at its best, you arrive at a sense of the essence of the person painted. With Walton’s portraits, I was struck by this idea of an additional level of reality, not the ‘hyperreality’ of gaudy colours, or an even-better-than-the-real-thing faux verisimilitude, but more a sense of what Otto Dix was talking about when he said that by focussing on the ‘outside […] the inner follows by itself. It is mirrored in the visible’. Most people look at portraits, indeed at painting itself, on a personal level – is it recognisable, is it a likeness, what does it make us feel? Most painters, on the other hand, paint in an inescapable context of what has gone before, and that’s a weighty legacy against which to create. Addressing this legacy is not a question of historicism, but instead of recognising that the ideas and conundrums that have occupied painters in the past are still troubling today, and that they stem from universal concerns about perceiving and understanding the world. The waters of these painted debates have been muddied by abstraction, and yet while the forms may change, the questions remain – what are the ideal subjects for art, how does the painted image differ from its source, what may be learned from the long scrutiny of the object (or subject) that it takes to make a painting, and what is the time, or the duration of a work of art? By this last, I mean, is a painting a frozen moment, something eternal; or does it represent the period over which it came into being? Commenting on the relationship that abstract painting has with realism, Marlene Dumas observed: ‘The abstract painters always insist on their connection with the visible reality, while the so called figurative artists insist that what they really care about, is the abstract qualities of life.’ Attempts to get to grips with what is real and what is not have occupied art, science, philosophy and literature since (and before) recorded history began. Plato held that the things around us are merely shadows of their true and essential selves, which exist on a higher plane. Following this, painting is, then, either a symbol of a symbol, and therefore even further removed from essential truth, or it is, through the artist’s eye, connected back directly to the original Platonic form. The story of Zeuxis and Parrhasius, to which Walton has referred in his own writings, describes how Ancient Greece’s two greatest artists held a competition to see whose art was the best. Zeuxis painted grapes that were so ‘real’, the birds flew down to peck at them, but when he went to draw back the curtain from the painting by Parrhasius he found that the curtain itself was the painting. Two thousand years later, psychoanalytic theorist Jacques Lacan used this story to observe that the animal mind is attracted to the surface qualities of things, while human cognition prizes what is hidden, what lies beneath. To put it another way, animals observe, humans analyse. Returning to Dumas’ comment concerning the different terrain claimed by figuration and abstraction: by her analysis it is the figurative that connects most closely to deeper truth (revealed through use of recognisable symbols), and the abstract that concerns itself with looking at surfaces. Yet in our symbol-saturated age (the ‘Nike tick’, the interlinked double-C of Chanel, the marques of luxury cars) it seems we increasingly mistrust the symbolic in art. Perhaps this is due to the way symbols have been cheapened by advertising, or the diminished role that symbols play in an era of mass-literacy, prior to which, images were expected to be understandable as texts, and always open to narrative. Alternatively, as the artist himself has suggested, our psychological distance from symbols is due, in part, to the fact that there are no longer any grand cultural narratives in which we all believe. Nonetheless, the symbolic generally remains legible, if no longer central to many contemporary readings of art. 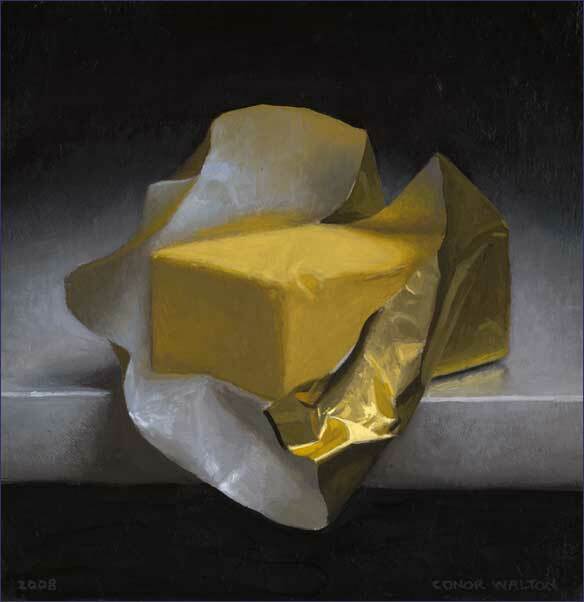 Walton’s Butter, 2008, is a rich yellow half pound block, nestling against the gold of its wrapper and positioned at the edge of a table or ledge. It is not just an expertly executed work in paint, attractive to the eye but also to the mind. Instead, like flowers and fruit in a still life, it is a moment held eternal in art, in the face of implied temporal decay. The same is true of Walton’s bunches of grapes, and here I want to emphasise that, while we are in the realms of the symbol, of representation, of the real and the rendered, nothing on the printed page, or in the pixels of the internet prepare you for the reality of Walton’s paintings in front of you. There is a shocking brilliance to them, and a sense that through them you are making a connection to either Plato’s form, or what indeed lies beneath. This brilliance isn’t chance or luck, although it has plenty to do with skill and talent. It is also indebted to the science of looking, a science to which the artist alludes in works such as The Threshold of Liberty, 2008, and The Discovery of the Future, 2008. In the age of Leonardo, science and art weren’t so separate. To hypothesise about the world, the stars, anatomy, mechanics and ballistics, it was necessary, after all, to observe, to look, and to do it deeply and thoughtfully. This way of looking, and the artist’s choices in objects, juxtapositions, composition and framing, inevitably loads images with meaning, and this is something Walton is not prepared to shy away from. In an art historical context, his work could be said to sit between the traditions of Vanitas and the formal still lifes that elect to show timeless perfection. 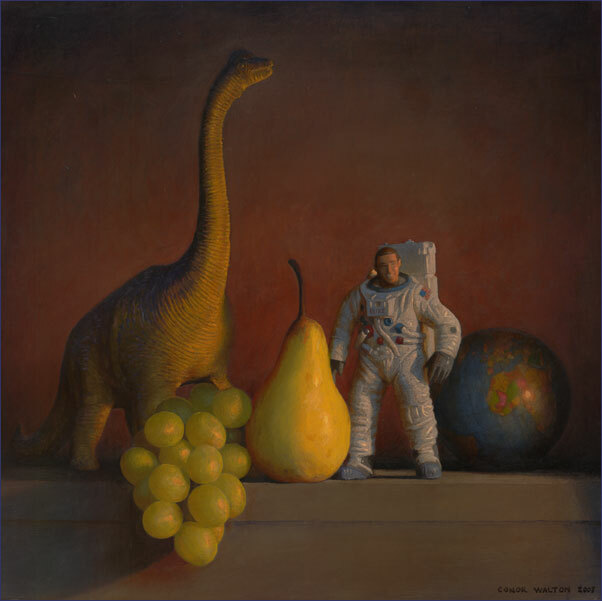 Dinosaur, 2008, sets a toy astronaut beside a plastic dinosaur, next to fruit and a small globe (no larger than the pear in the picture). The dinosaur towers above all, and on the surface the message is clear: all things will decay, all will pass, and even the greatest, the most futuristic of beings will become historic, perhaps even extinct. 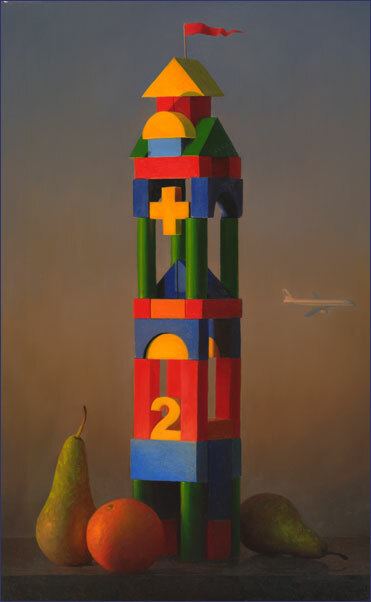 Similarly I’m Still Standing, 2008, shows us a tower made from a child’s building blocks, again with fruit in the foreground and, in the distance a tiny aeroplane turning for a circle. Encoded in this, alongside the historic iconography of fruit are those icons of a more recent vintage – the tower juxtaposed with a plane. Again, a surface reading may appear (at first) easy: the instruments and targets of war appear as playthings in the hands of overgrown ego-driven boys, fresh now, and yet all subject to the leavening endeavours of time. Nonetheless, that sense of timelessness held in the image is disrupted by the contemporary elements. These new symbols in the lexicon of representation jar at first, shockingly out of context with our sense of the ‘safe historicism’ of the Still Life genre. By this I mean that we tend to apply the comfortable lens of passed time to looking at this kind of painting, and are less comfortable when the use of certain imagery makes it contemporary. These days, it sometimes seems, we prefer our art to decorate and elevate, rather than provoke complex thought. Something similar is going on with the use of skulls as a symbol. In the sixteenth century, one might have expected the frequent appearance of skulls in art, even turning up as a surprise anamorphic shape masquerading as a carpet (Holbein’s The Ambassadors 1533). Today they may linger on the hinterland of cliché, though clichés are such because their very appositeness has caused the overuse that passes them into stereotype. In Walton’s work, his use of the skull as an image (Cyclops, Endpiece, both 2008) calls into question contemporary painting’s relationship with art history. This also connects to a question raised earlier, which is to do with the act of painting itself: and this is the central question of time. The time of a painting is a fluid thing. There is the time of the depicted elements: the seasonality of flowers and fruit, often manipulated by artists placing them out of context with one another; or the temporal framework for objects such as particular books, aeroplanes, kitchen scales and astronauts. Then there is the durational time it takes to create a painting, the single narcissus in a vase will have wilted long before the last brushstroke is applied, the grapes may have shrivelled in their cluster. There is also the spuriously eternal nature of painting, the sense that it is something immemorial, although paint and canvas too are subject to the depredations of time and history (none of Zeuxis’ works remain, only the stories still told about them). And finally there is the time that is brought to the work by us, the viewers: how long are we prepared to stand before a painting? How much time will we spend, not just looking, but thinking about its presence and its meanings? These are all questions missed by a reading of Walton’s work that lingers merely on surface symbols. Presented alongside the still lifes are a series of landscapes. Again, in the flesh, rather than reproduced in a catalogue, they are worlds of their own, worlds that tempt you to walk into them, and then perhaps to connect, as with his still lifes and portraits, with the something deeper that lies beneath and beyond their beautifully wrought surfaces. Gemma Tipton is a writer and critic based in Dublin. She writes regularly for Circa and The Irish Times and has written and edited a number books on contemporary art and architecture. This essay first appeared in the exhibition catalogue Conor Walton: Landscape and Still Life, in 2009.